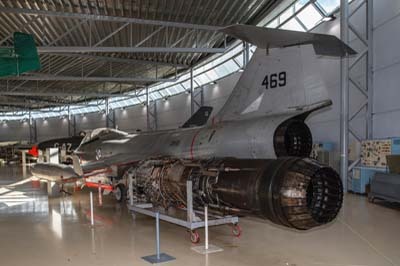 The Forsvaret Flysamling museum was established in 1967, but was not opened to the public until 1984 when a former German hangar was used for around 30 aircraft. In 1999 the former German hangar was demolished. 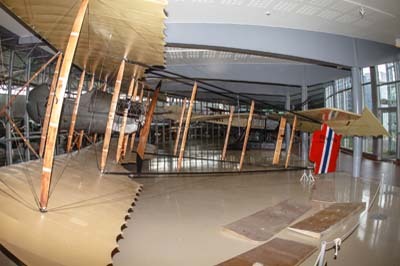 In May 2000 the current and attractive new building was constructed at Gardermoen and the exhibits were put on display. 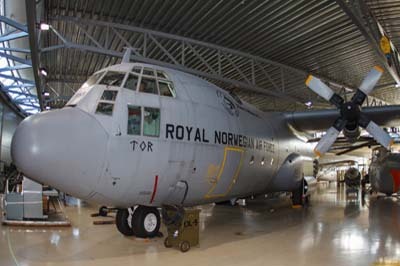 It appears that exhibits are shared or swapped with those held at the Norwegian Aviation Museum at Bodø. Today there are many interesting exhibits representing Norwegian aviation, none finer than the Rumpler Taube which was the first military aircraft in Norway when it was donated to the Navy in 1912. Left to right: The Rumpler Taube 'Dove' was the first mass-produced aircraft built in Germany and was the first military aircraft in Norway when it was bought by Norwegian Naval Officers at Horten in May 1912 and named 'Start'. 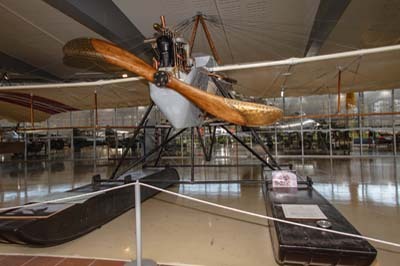 Damaged in 1915 it was rebuilt and flew for the last time in 1922 before being donated to a technical museum. 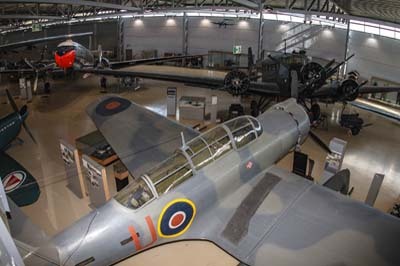 During the German occupation of World War II it was taken to its original base at Horten and rebuilt and displayed in a hall. In the 1950s it was returned to Oslo and eventually put on display in 1973, moving to the new museum building at Gardermoen for its opening. The Etrich Taube aircraft was developed by 'Igo' Etrich from Austria in 1909, its first flight was in 1910. The Taube design was licensed by 'Igo' Etrich to Lohner-Werke in Austria and also to Edmund Rumpler in Germany who initially named the examples he built the Etrich-Rumpler Taube. Rumpler later changed the name to Rumpler Taube and stopped paying royalties to Etrich who subsequently abandoned his patent. Another example is at the Národní Tecnické Muzeum in Prague. Royal Aircraft Factory BE.2e (131 ex A1380). 22 of these two-seat reconnaissance aircraft were purchased from the RAF in 1917 and delivered for the Flying School at Kjeller and later on to the South Norwegian Aviation Unit. They were withdrawn from service in the early 1920s. 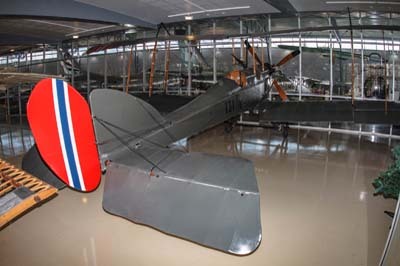 The example on display served with the South Norwegian Aviation Unit until 1924 when it was retired. 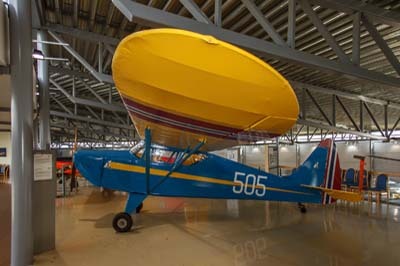 Farman F.46 (25). Two aircraft were ordered for the Norwegian Army Air Force in 1919. They were little used by the Flying School at Kjeller. 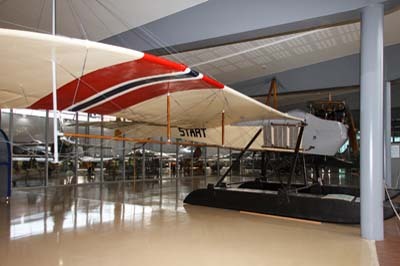 The example on display arrived in 1921 and only flew for six hours before it was put into storage in 1925. In 1928 it was struck off charge. Left to right: Fairchild M-62A Cornell PT-19 (103 'AB-L' c/n T40-208). Six PT-19s were delivered to the Norwegian training camp known as 'Little Norway' in Toronto, Canada at the end of 1940 to train Norwegian pilots. The Norwegian government later purchased another 30 aircraft mostly paid for by Norwegians living in North and South America. The example on display was delivered in 1940 and remained in service until 1956. Fairchild PT-26B Cornell (205). 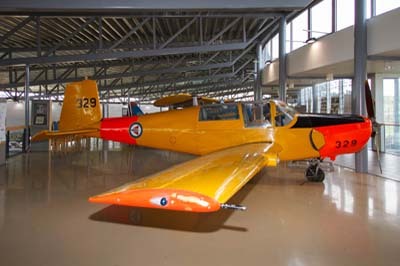 A total of 5,122 PT-19s were built as primary trainers, the PT-26 was a variant built with a cockpit canopy for the Royal Canadian Air Force. 36 plus another 50 of these aircraft were in use at the 'Little Norway' training camp. At the end of the war they were transferred to Norway only to be replaced by the SAAB Safir in 1953. 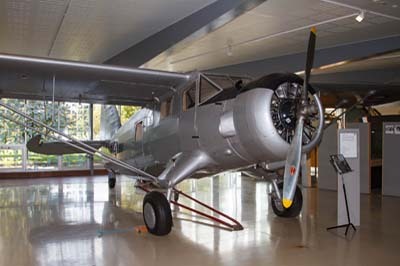 The surviving PT-26s were sold to the Norwegian Aero Club and today only four remain. Interstate S.1A Cadet (505 c/n 203 ex LN-DAV). The S-1A Cadet was produced by Interstate Manufacturing Co. in California between 1941 and 1943. Two aircraft were donated to the 'Little Norway' training camp in 1942. They were used for liaison duties and in 1946 they were given to the Norwegian Aero Club. 505 was registered LN-DAV in 1946 but in 1952 crashed while flying from the frozen Lågen river at Fåberg. 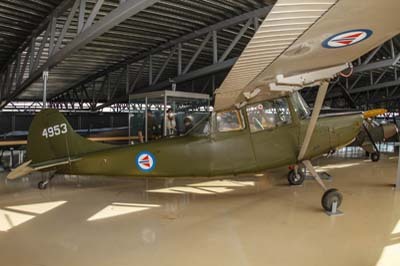 In 1970 the Norwegian Historical Aircraft Society took possession of it and in 1985 donated it to the museum where it was fully restored. SAAB 91 B-2 Safir (329 ex 57-329 c/n 91329). 25 Safirs were delivered between 1956 and 1957 to replace the Fairchild Cornells. 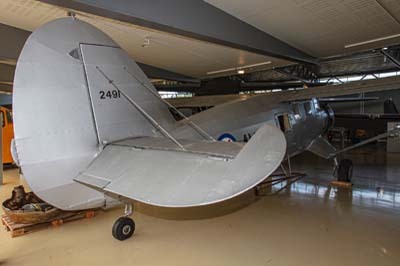 They were used for basic flying training at the Flying School at Værnes. An additional five aircraft were delivered in 1978. The type was withdrawn from service in 1982. Left to right: Noorduyn Norseman Mk.IV (2491 'AV-R' ex 63-8469 and LN-BDP). This adaptable aircraft can operate in severe conditions with wheels, skis or floats. Norway received eight Norseman in 1945 with another 14 in 1953. With the Air Force they were used for communications duties before their retirement from service in 1959 when they were sold for civilian use. 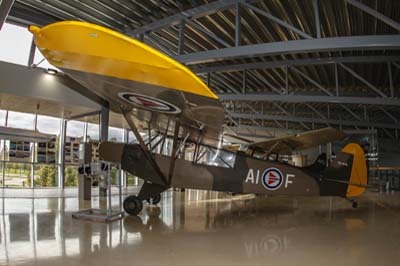 The aircraft on display entered service with the RCAF in June 1941. In 1953 it was transferred to Norway in 1951 for the Communication Flight at Bardufoss, it was later sold to Fjellfly in 1957. After a period as LN-BDP and later SE-FUP it returned to Norway, again as LN-BDP, in July 1977. It was exchanged for a SAAB Safir in 1982 by the Armed Forces Museum and restored at Gardermoen. Lockheed C-60A Lodestar (painted as 'G-AGIH' it is really ex 42-55983 to OH-MAP, to OH-SIR, to G-BMEW). 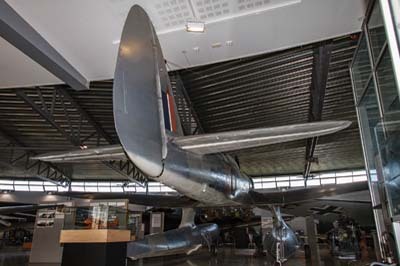 Two Lockheed 18s were bought by the Norwegian Purchasing Commission from BOAC in 1942 with a further seven C-60A Lodestars which were acquired from the USAAF under lend-lease agreement and initially operated by BOAC with Norwegian crews. They were used during World War II to ferry passengers on a hazardous route between Stockholm to Leuchars in Scotland, with the first flight being made on August 18, 1941. After the War the Norwegians used the aircraft for transport duties with 335 Squadron until 1951 when they were sold in Sweden and Finland and replaced by the C-47A. 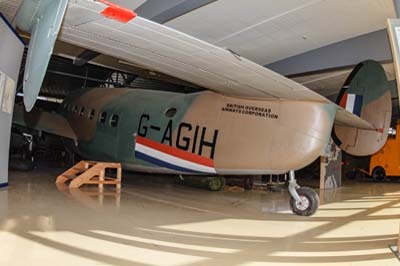 The example of display was painted in the colours of G-AGIH/42-56018 in 1986, the original had arrived in the UK in June 1943 but crashed near Strathaven in Scotland in January 1944. 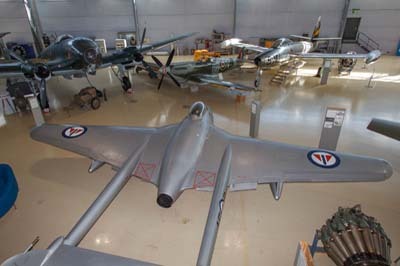 Left to right: Northrop N-3PB (F.20 c/n 320). 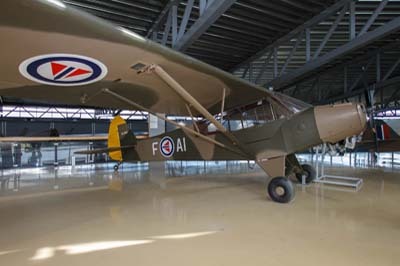 The first N-3PB flew in December 1940 from Lake Elsinor, California. The N-3PB three-seat patrol-bomber seaplane was designed for the Norwegian Government and 24 were ordered by the Norwegian Naval Air Arm. Following the German occupation six were delivered to Canada and the remaining 18 delivered to Iceland for service with 330 (Norwegian) Squadron established on April 25, 1941 as part of the RAF Coastal Command. The aircraft were used to patrol the seas around Iceland to protect Allied vessels. They were involved in attacks on German submarines and with dog-fights with long-range Focke-Wulf FW 200 Condor patrol aircraft. The example on display is the only surviving example in the world. 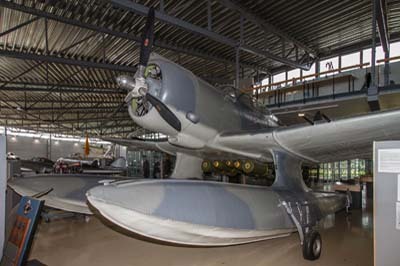 It had crashed in April 1943 in Thjorsa river and salvaged in 1979 and restored by Northrop in California before being donated to Norway in 1980. Left to right: Piper L-18C Super Cub (53-4845 'AI-F' c/n 18-3245). Designed and built from the 1930s 16 L-18Cs were delivered to Norway for the Field Artillery's Observation Post Unit in 1955, they were initially based at Værnes Air Base. The remaining aircraft were eventually retired in 1992 and donated to the Norwegian Aero Club. 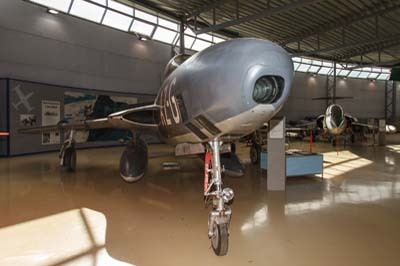 The example on display was transferred to Bardufoss in 1958. 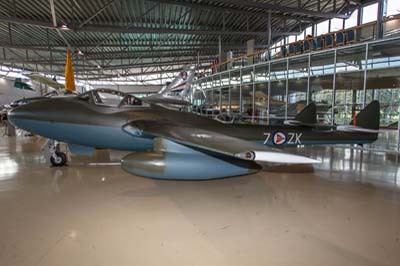 It was eventually written off in 1976 in a crash and sent to the Royal Norwegian Air Force's technical training centre at Kjevik, where it was restored in 1982 and passed to the museum. 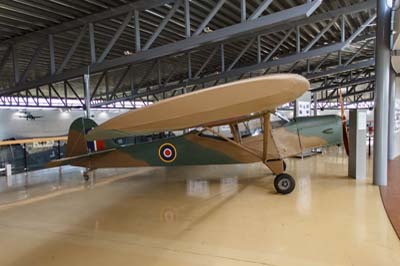 Taylorcraft Auster J/1 Autocrat (painted as RT514). A number of Auster Mk.IIIs and IV's were supplied by the Royal Air Force to Norway and were operated by 331 and 332 Squadrons. 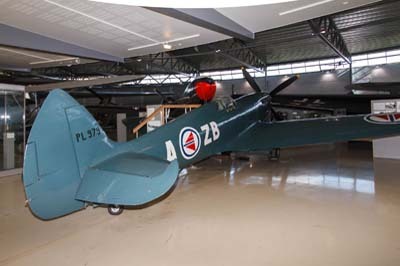 The J/1 Autocrat on display is painted to represent one of the aircraft supplied to 332 Squadron in 1944. It was actually built at Rearsby in 1946. Registered in Switzerland as HB-EOT before going to West Germany, where it flew for ten years as D-EDAX at Hildesheim. Later sold in Denmark it became OY-DUY in 1967 only to crash in 1968, it was struck off the register in 1973. 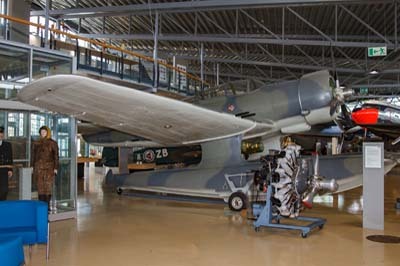 The Museum acquired the fuselage in 1987 and assembled it with the wings from OY-DTP. Cessna O-1A Birddog (4953 ex 51-4953). Norway received 27 of these two-seat communications and observation aircraft between 1960 and 1968. In service they were used for fire control and artillery observation with the Field Artillery's Observation Post Unit's across Norway. 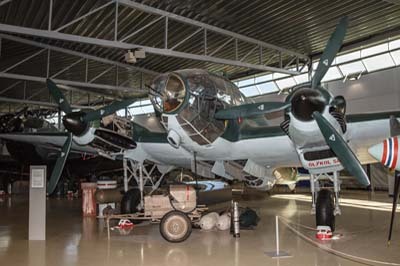 The unit disbanded in 1992 and the surviving aircraft were retired, most of which were sold in Brazil. 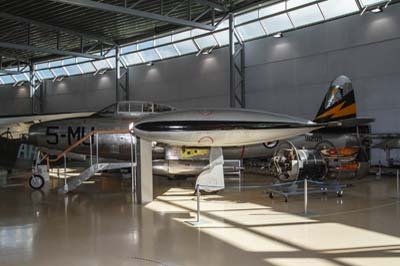 The example on display was delivered in 1968 and was initially based at Gardermoen before moving to Torp. Left to right: Bell 47 D-1 (642 'BE-D') Bell Helicopters built 5,600 examples in the United States. Six aircraft were in service with the Norwegian Air Force from 1953 to 1968 with 719 and 720 Squadron for pilot training. 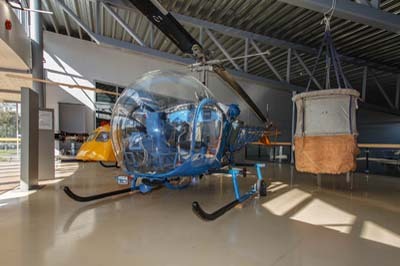 Sold to the civilian market as LN-ORM it was retired from service when with Helilift and given to the museum in 1972. Sikorsky H-19D-4 Chickasaw (64279 ex 56-4279). Four H-19Ds were ordered for the Royal Norwegian Air Force for Search and Rescue duties in 1958. They were retired in 1967. 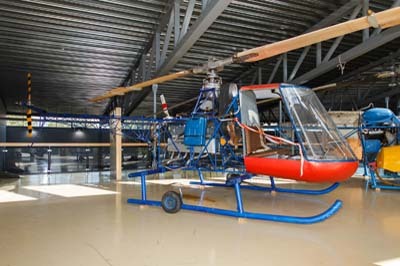 The helicopter on display served at Sola and Bodø before becoming an instructional airframe in 1967 at LTS Kjevik. It was later restored at the museum by enthusiasts. Kjeller PK X-1 was an experimental helicopter constructed by Paul Kjølseth at the Kjeller Aircraft Factory in 1955. A second prototype the PK X-2 was built in 1962 but was no more successful, the Bell 47D was ordered instead. Kjeller started aircraft manufacture in 1912, it was owned by the Norwegian Government and operated by the Norwegian Army Air Service and mostly built foreign aircraft under license, such as the Fokker C.V and Tiger Moth. Bell UH-1B Iroquois (966 ex 64-13966 c/n 1090). Under the US military defence assistance program Norway received twelve UH-1Bs between 1963 and 1965. An additional 25 were bought between 1966 and 1976. 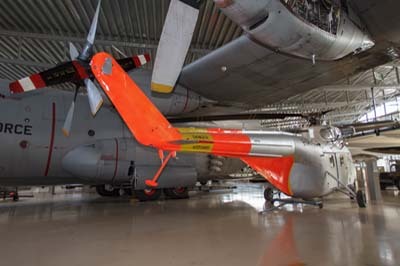 In service with 339, 719 and 720 Squadrons they were mostly used for Search and Rescue (SAR) from 1964 to 1990. 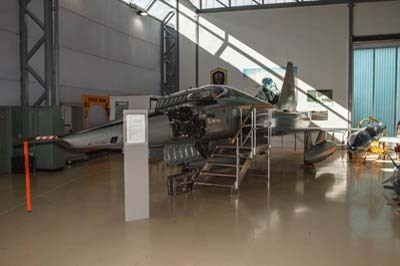 966 was delivered to Kjeller Air Base in 1966 and assigned to 729 Squadron, twenty years later it was given to the Armed Forces Museum and flown to Gardermoen in 1991. Left to right: Supermarine Spitfire PR.XI (PL979 'ZB-A'). Three photo-reconnaissance variants were supplied to the Royal Norwegian Air Force in 1947. Initially serving with 331 Squadron they were transferred to the newly created No.1 Photo Reconnaissance Flight in 1949. They were withdrawn in 1954. 47 ex RAF Spitfire Mk.IX were also operated by the Air Force from 1945. The example on display served during World War II with the RAF before its transfer to Norway in 1947. 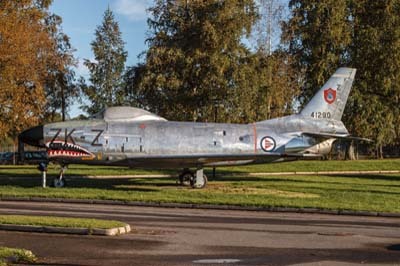 It was restored at Rygge Air Base later moving to the museum. Junkers Ju52/3mg4e (CA+JY c/n 6657). 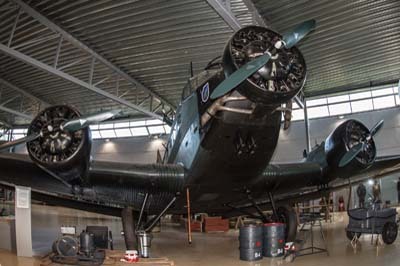 The Ju52 was originally designed as a bomber in the 1930s but was mostly utilised as a transport aircraft. During the invasion of Norway in April 1940 they were widely used for transportation of troops and supplies. On April 13, 1940 the example on display was one of twelve tasked with dropping mountain troops near Narvik, before force landing on the nearby frozen Hartvigvann lake following an attack by Norwegian and British aircraft. All twelve remained there untill the spring thaw when they all sank. CA+JY was salvaged in 1983. 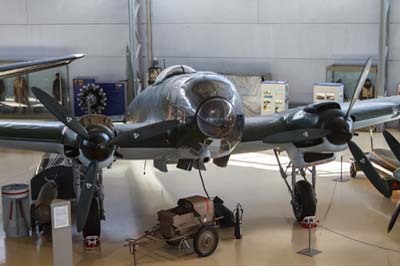 Left to right: Heinkel He111 P-1 (5J+CN c/n 1526). 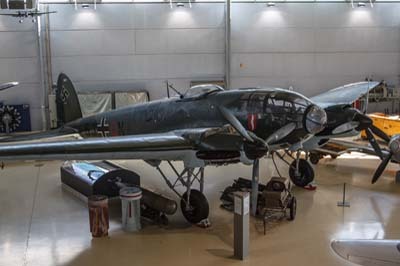 During the German invasion in April 1940 and subsequent occupation Kampfgeschwader (KG) 4, 26 and 54 and Lehrgeschwader 1 flew the He111 as a bomber and tactical transport aircraft. 5J+CN on display was operated by KG4 during the invasion. Based at Oslo from April 23, 1940 it bombed Namsos on the following day. During another bombing raid on April 26 it was shot down by two RAF Blackburn Skuas flying from HMS Ark Royal, force landing in snow at Digervarden. In 1976 the wreck was salvaged and taken to Gardermoen where it was restored over a six year period. 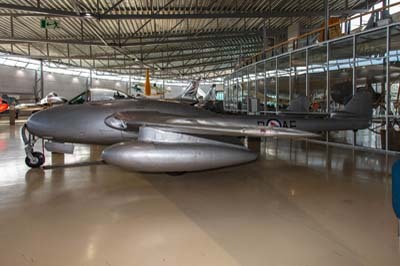 Left to right: de Havilland DH.100 Vampire F.3 (EP42408 'AE-B' ex VT833). 23 F.3s were supplied to the Royal Norwegian air Force in 1947 from RAF stocks. The F.3 served in Norway until 1957 with 331, 336 and 337 Squadrons and also with the Jet Training Flight. 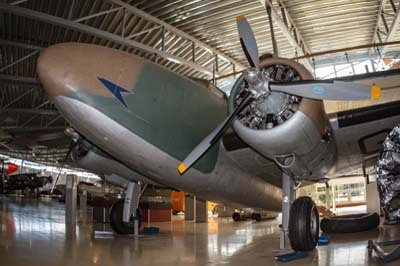 The example on display arrived in 1948 but was written-off in 1955 and put into storage at Værnes and later Rygge before its transfer to the museum. 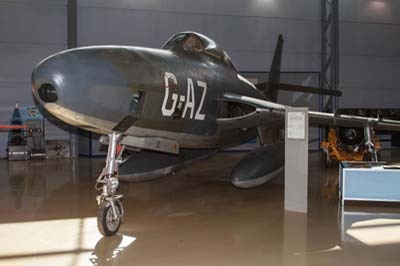 de Havilland DH.115 Vampire T.55 (Fv28456 unmarked but coded 'ZK-7'). Six two-seat T.55s were bought by the Royal Norwegian Air Force in 1952. They were used by 336 and 337 Squadrons and by the Jet Training flight before the five survivors were returned to the UK in 1955. 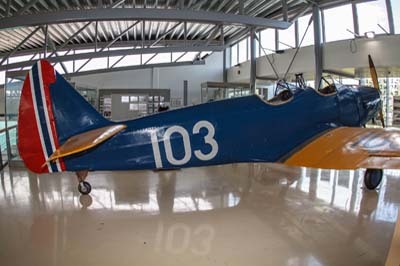 The example on display was originally built as a single-seat FB.50, it was converted to a two-seater for the Swedish Military Flying School at Ljungbyhed where it served in 1968. 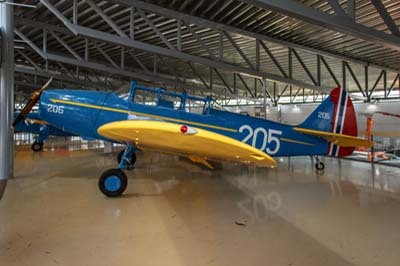 It was given to the museum and restored in the colours of a Norwegian T.55. Left to right: Douglas C-47A Dakota (93797 ‘BW-L’ ex 42-93797). In 1945 Norway received seven C-47’s for Norwegian Air Lines, another ten were delivered in 1950 for the Air Force under the US military defence assistance program, six of which went on to Denmark in 1956. The remaining aircraft continued in service until 1974. 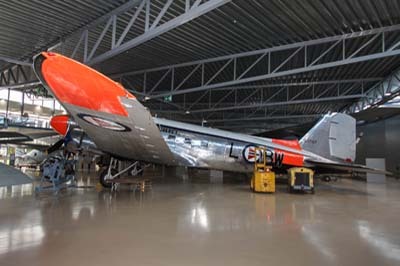 ‘BW-L’ arrived in 1950 and was converted to a passenger transport in 1958, making its last flight in 1973. 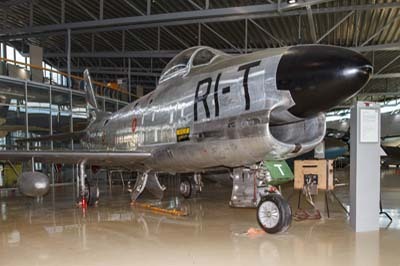 Republic RF-84G Thunderjet (111209 'MU-5' ex 51-11209). 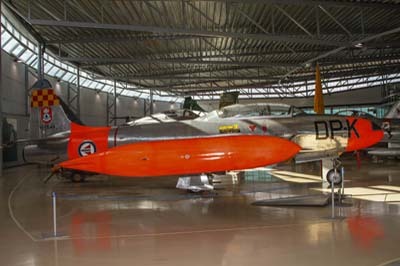 200 F-84Gs were supplied to the Air Force from 1952 under the US military defence assistance program. They were used by 334, 331, 336, 332, 330 and 338 Squadrons in the fighter-bomber role until their withdrawal from service in 1960. 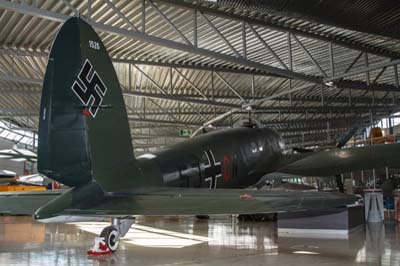 111209 on display arrived in 1954 and served with 331 and 338 Squadrons until it was retired in 1960. 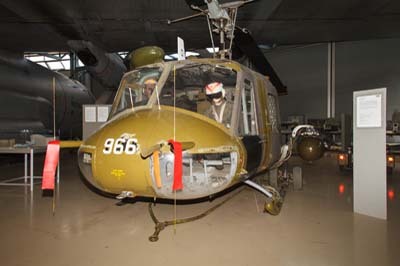 It arrived at the museum in 1973 and was restored by volunteers. 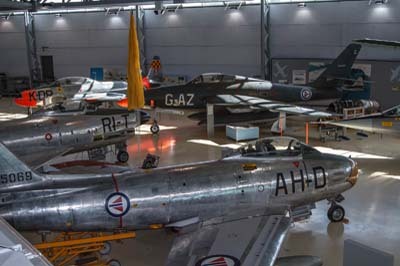 Left to right: Lockheed T-33A Shooting Star (117546 'DP-K' ex 51-17546). 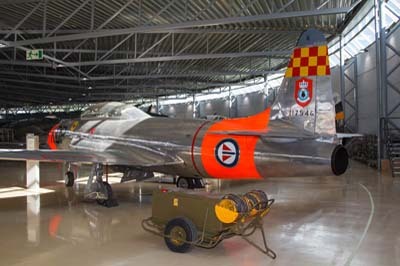 At least 22 T-33s were supplied to Norway from 1953. 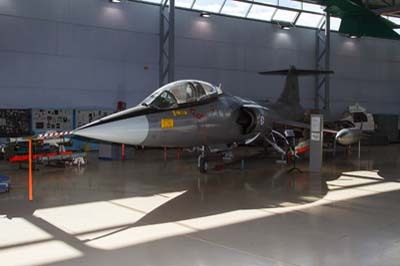 They were used by 718 Squadron (Jet Training flight) for advanced pilot training and later target-towing at Sola until their withdrawal in 1972 when they were acquired by the French Air Force. 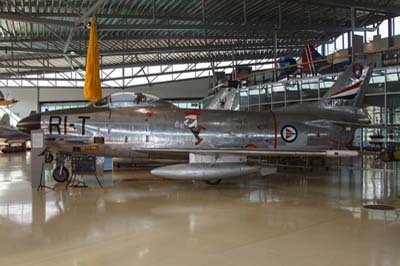 The T-33A on display was delivered in 1954 and served until 1968 when it went to France for three years before returning to Gardermoen in 1981 for preservation. 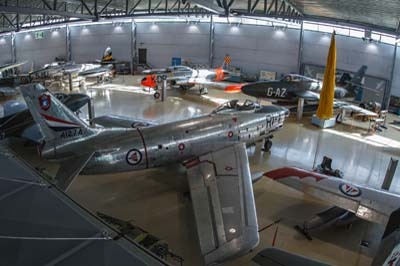 Left to right: North American F-86K Sabres (41274 'RI-T' ex 54-1274 and 41290 'ZK-Z' ex 54-1290). Between 1955 and 1960 60 F-86Ks were delivered to Norway under the US military defence assistance program. 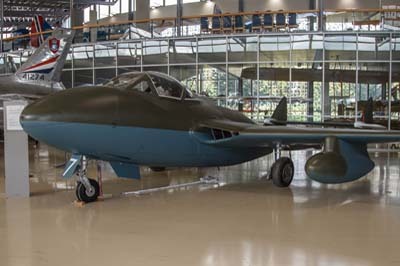 An additional four aircraft were supplied by Fiat in Italy. 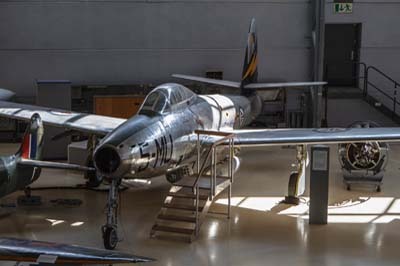 The F-86 was designed as an all-weather day and night fighter interceptor using its Radar. It was later modified to carry side-winder air to air missiles. 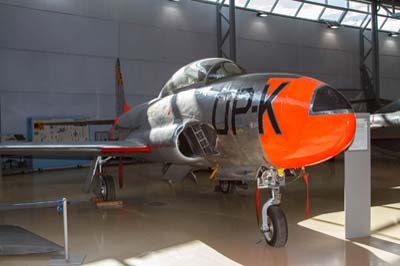 The F-86K served with 332, 334, 337 and 339 Squadrons till the variant was retired in 1968. 41274 on display served with 337 Squadron at Gardermoen from 1956, later transferring to 337 Squadron before its withdrawal from service in 1967. 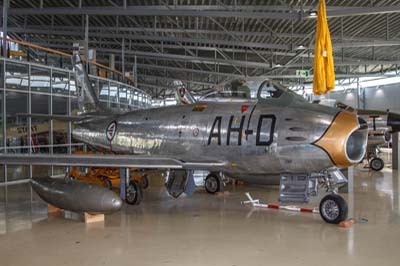 Left to right: North American F-86F Sabre (25069 'AH-D' ex 52-5069). 116 F-86Fs were received under the US military defence assistance program between 1957 and 1961. 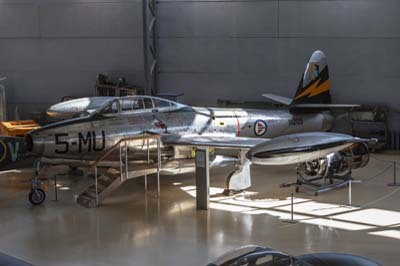 The F-86F was utilised as an interceptor and fighter-bomber and was the first Royal Norwegian Air Force aircraft capable of breaking the sound barrier. 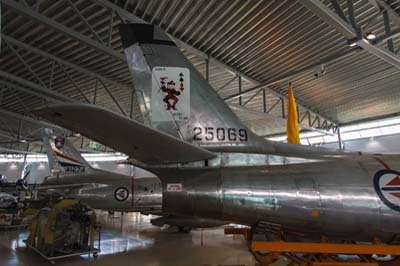 331, 332, 334, 336 and 338 Squadrons flew the F-86F, the variant was finally withdrawn in 1966. 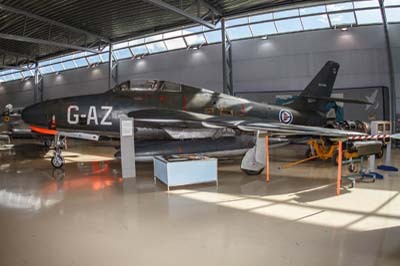 The example on display was delivered in 1961 and served with 332 Squadron and the 'Joker' aerobatic display team before it was withdrawn from service in 1966. 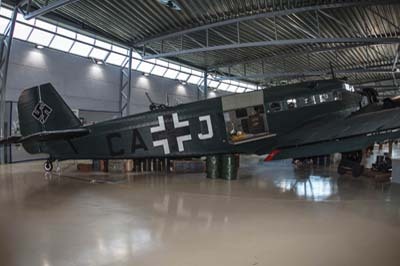 It was restored at Rygge Air Base. Left to right: Republic RF-84F Thunderflash (117053 'AZ-G' ex 51-17053). 18 RF-84F were delivered between 1956 and 1957 followed by an additional twelve between 1958 and 1961. Its design was based on the F-84F Thunderstreak fighter-bomber, with six camera's in the nose the RF-84F was utilised for photo-reconnaissance. They were assigned to 717 Squadron and were initially based at Sola Air Base, until their transfer to Rygge in 1961. The type was withdrawn from service in 1970. Left to right: Lockheed TF-104G Starfighter (469 ex 63-8469, 27+70). Under the military defence assistance program 19 F-104Gs and four two-seat TF-104Gs were supplied in 1963, these were allocated to 331 Squadron at Bodø for fighter-bomber duties. A further 19 CF-104s were received from Canada in 1973 with three two-seat CF-104Ds for pilot fighter-bomber conversion. In 1975 an additional five aircraft were received including two ex German two-seat TF-104Gs. The F-104 was eventually replaced by the F-16 Fighting Falcon introduced in 1981, the single-seat aircraft were withdrawn in 1981 and most of the original F-104s going to Turkey and in 1983 and the two-seats retired in 1986. The two-seat TF-104G on display was operated by the Luftwaffe training centre at Luke Air Force Base in Arizona, before it was delivered to 331 and later 334 Squadron in 1981 before their retirement in 1982.
de Havilland Canada DHC-6 Twin Otter (7062). Four Twin Otters were bought by the Royal Norwegian Air Force in 1967 with one more arriving in 1973. The five aircraft served with 719 Squadron at Bodø until they were retired in 2000. 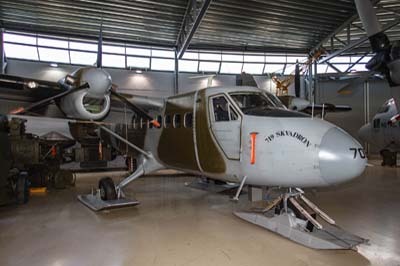 The Twin Otter on display arrived in 1967 and had served for 33 years before joining the museum in 2001. Lockheed C-130H Hercules (953). Six of these transports were in service with the Air Force from 1969 with 335 Squadron. 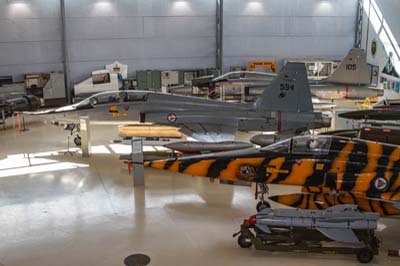 Left to right: Northrop F-5A Freedom Fighter (208 ex 66-9208). 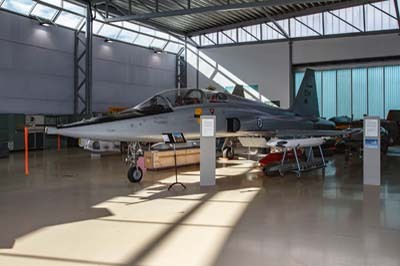 The F-5 was selected by the Royal Norwegian Air force to replace the F-86 Sabre. Three squadrons were initially supplied with 56 F-5A and six two-seat F-5Bs under the US military defence assistance program. The Norwegian government funded an additional 22 F-5As, 16 RF-5A for photo reconnaissance and eight F-5Bs. The aircraft were delivered between 1966 and 1970 and they were operated by 332, 334, 336, 338, 717 and 718 Squadrons. 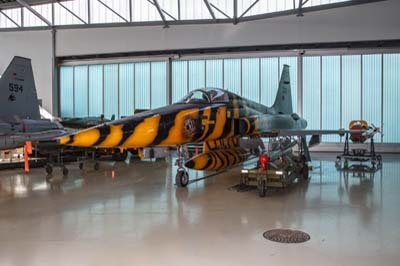 208 on display is painted in a NATO 'Tiger' Squadron scheme when it was with 336 Squadron in 1994. Northrop F-5B Freedom Fighter (594 ex 65-10594). 14 two-seat F-5Bs were supplied to the Air Force. Northrop RF-5A Freedom Fighter (105 'AZ-M' ex 68-9105). 16 RF-5A were bought for the reconnaissance role, when they were retired they moved on to the Turkish Air Force in 1987.